RUN FOR THE HILLS! Well, not really - but the discovery could let us learn more about one of History's deadliest infectious diseases. 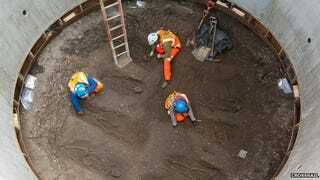 Discovered during excavation for London's ongoing Crossrail project, the bodies were found just outside Charterhouse Square - which, at the time when the Black Death was beginning to ravage the country was declared as a 'No-Man's Land', outside London's walls - along with several pieces of pottery dating from the 14th Century. The nature of the bodies' relatively neat graves already tells us that these people were some of the earlier victims of the Black Death, before the disease became a true Pandemic that saw widespread Mass graves used to dispose of victim's corpses. "We've found archaeology from pretty much all periods - from the very ancient prehistoric right up to a 20th-Century industrial site, but this site is probably the most important medieval site we've got," said Jay Carver, project archaeologist for Crossrail. "This is one of the most significant discoveries - quite small in extent but highly significant because of its data and what is represented in the shaft."